André Czeglédy went back ‘home’ to his family roots in Central Europe, visiting several key institutions attached to his work on museums of genocide and oppression that deal in fundamental issues of trauma, historical memory, nation and identity. In Budapest, he visited the Holocaust Memorial Centre and Archives to continue organizing a series of joint mini-conferences on the institutional/public interface in such museums, and later travelled to Hódmezővásárhely, in the rural south of Hungary where the Memory Point Museum anchors museological, research and educational activities for a famously agricultural region of Hungary. A side trip to the Czech Republic allowed him to visit the Museum of Communism in Prague, the first time he had this opportunity, and a shorter trip across the border to the town of Štúrovo in Slovakia amplified his understanding of Hungarian diaspora relations as inscribed within the built environment. Ironically, upon his return, he realized that he had far more photos of others (both people and things), than of himself. Hence his conspicuous absence from the picture in this article! 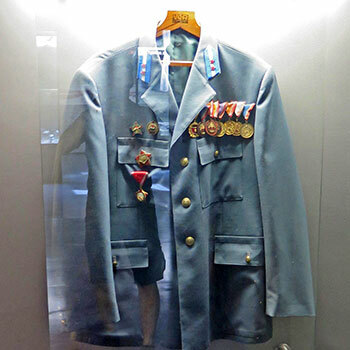 Photo: Display of Worker’s Guard uniform at Memory Point Museum in Hódmezővásárhely, Hungary.